After spending close to $50 billion, the government hopes that next year’s Winter Games are not only a success but a catalyst for positive change in the country’s volatile south. RIR asked delegates at the Sochi Economic Forum for their take. 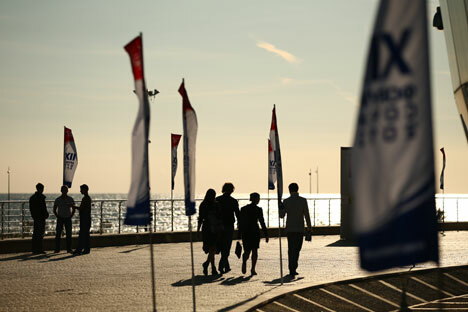 In stark contrast to the gloomy economic news coming from leading ministers in Prime Minister Dmitry Medvedev’s cabinet at this year’s Sochi International Economic Forum, the mood of local officials was considerably more upbeat. This comes as no surprise: The federal government is wrapping up construction for the most expensive Olympic Games in world history, with a price tag of $50 billion. New railways, highways, stadiums, hotels, ice rinks, residential districts and an airport have been constructed in record time, to turn this previously quiet resort town and home to Stalin’s villa into a world-class sporting venue. “Our economy grew over 15 percent from 2009 to 2012, with construction’s share doubling from previous years,” said Igor Galas, the regional minister of economic development. To remind visitors of Sochi’s tourism potential after the Games, the forum’s program this year included Formula One racing, a farmers’ market, local wine and brandy tasting and, most notably for some, a Scorpions concert. “When you bring such big events to a country, they leave a legacy that includes infrastructure, optimism, jobs and, sometimes, even new industries like sports marketing,” said Zoran Vucinic, president of Coca-Cola’s Russia, Belarus and Ukraine Unit. Galas was more direct: “Investors are attracted by accomplishments, not promises. Sochi is now our brand for pulling them in.” Russia’s international reputation has been damaged recently by everything from the anti-gay propaganda law to human rights abuses in prisons and general corruption. But the biggest concern has been the volatile situation in the adjacent Caucasus Mountains regions of Ingushetia and Dagestan, which have been plagued by sectarian violence and severe government crackdowns that beget more violence, according to analysts of the region. “I seldom hear that the upcoming Olympics will take place in the Caucasus—only in matters related to security,” said Ramazan Abdulatipov, president of Dagestan. “Olympic objects are only the tip of the iceberg. We spent colossal sums on housing and other social projects, so that Sochi will have a completely different standard of living after the Games,” said Galas.